What’s the first thing you think of doing when you get injured? Most would say ice the injury, whether it’s a ligament sprain or a pulled muscle or a twisted knee or ankle. The next thing people tend to do is put a bandage over the area to compress it. Should you be doing all this? The simple answer is yes- but there’s a bit more to it than that. The old PRICE regime for new injuries (Protect, Rest, Ice, Compression, Elevation ) has been improved with clinical research to become POLICE- Protect, Optimum Loading, Ice, Compression and Elevation. A new sprain or strain needs to be protected from further damage- so remove the danger immediately. If you’re on a GAA field or a running track, stop and get to the side of the pitch or track. If you’re out for a run on the roads, get picked up if possible or walk home! Research into ligament sprains and muscle and tendon strains has shown fairly consistently that most injuries benefit from some movement even in the early stages. Complete rest of the injured area is usually reserved for quite severe injuries, like bone fractures or serious joint injuries. Even with those injuries, the joints and muscles away from the injury need movement. For example, with a bad shoulder injury, it is still important to keep the elbow and hand moving, while resting the shoulder. Complete rest of less serious injuries actually slows down the healing process and leads to longer spells out of action. 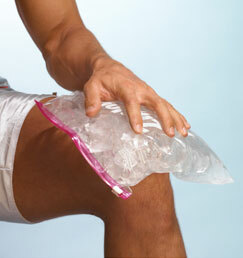 Ice is a traditional treatment for new injuries. It is widely thought that it reduces swelling but actually, the research hasn’t shown that that’s the case. Instead, it probably works to reduce pain by numbing the area and while icing their injury most people are also resting, so that probably plays a part in the apparent swelling reduction effect. Most people would tell you that it feels nice, especially if the injured area is hot. Be careful not to burn the skin with the ice! Compression works by actually forcibly preventing fluid from accumulating. It works really well around bony areas like the ankle or knee, but it’s not quite as effective with muscle injuries as there’s more room for the fluid to travel in. Finally, elevation of the injury or raising the injured part higher than the level of the heart will reduce the effect of gravity on blood flow and help the return of fluid caused by the injury. So, some changes to the ideal post-injury regime recently. Use these tips and you should start to notice changes within a few hours. If not, call us for an appointment. Welcome to the first post of our blog for Cahir Physiotherapy Clinic in Co. Tipperary. Here we hope to keep you updated regularly on the latest in injury prevention advice, cutting edge physiotherapy and exercise research and what we’re up to in our working week in Co. Tipperary. In spite of, or maybe because of, the awful weather we’ve been really busy with new injuries in the clinic over the past 2 weeks. Lots of people locally have been overdoing it with cutting trees and clearing gardens after the storm. This overload of unusual physical work, combined with a lack of exercise due to the prolonged bad weather, is a lethal combination for back pain, neck pain, shoulder and elbow injuries. In the physiotherapy clinic we’ve been busy treating patients with muscle and tendon injuries…. and I hear the chainsaw mechanics are busy too! The key thing to recover from these injuries is to rest from the offending activity- hopefully all the trees have been cut by now-and gradually return to your regular exercise routine. If you don’t normally exercise now is a great time to start. 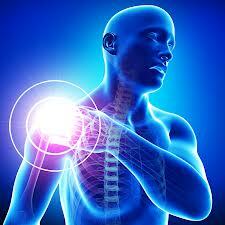 But…don’t just rest- your muscles, joints, tendons and ligaments prefer gentle movement even when sore. For example, if your shoulders are sore, try this: sitting tall, gently raise your shoulders towards your ears, stretch the shoulder blades back, then gently lower. Repeat this slowly and then change direction. Then still sitting tall, slowly lower your right ear towards your right shoulder gently then return to the middle again. Don’t force it. Repeat on the other side.